The HEAVY DUTY JUMBO RHINO ROLL is a giant roll of highly absorbent heavy weight wipes that are used for a variety of demanding cleaning tasks. Each roll contains 475 thick disposable wipers, that are made from high concentrations of wood pulp for greater absorbency, and strong, tear resistant polypropylene fibers for durability. Additional features include easy to tear perforations to ensure standard sized wipes, which reduces wastage, and the rolls are easy to freight and store, further reducing costs associated with bulkier products, such as rags. This is often used as a rag replacement wiper in INDUSTRIAL environments such as manufacturing, engineering , mining and marine, where it is used as a surface preparation material or for cleaning up water and fuel spills, oils, chemicals. 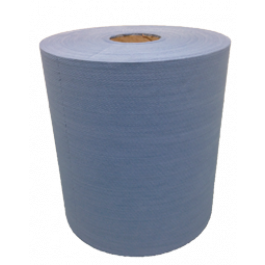 It has a non-abrasive, low linting texture, which makes for a great equipment polishing cloth, and it will not fall apart when used with cleaning chemicals. The other compelling feature of the JUMBO RHINO ROLL is its portability, and that it can easily be moved from one area to another, either to sit on tables or work benches for easy access or held in the floor stands that are available. Bulk packaging 475 wipes on a roll also has its economic advantages in substantially lowering the cost of each wiper, and whilst the wipers are disposable, they are long lasting and durable. This is the ultimate heavy duty wiper and with these features it can be applied to a variety of wiping tasks across most industries. For MEDICAL users, such as hospitals, medical clinics, dentists and veterinary clinics, RHINO WIPES are used for drying instruments and polishing stainless steel equipment surfaces. Being disposable and durable they are an ideal hygiene wiper to keep areas sanitary and healthy. Because they don't fall apart easily these wipers can be used to take care of challenging liquid spills, blood and urine, that you would not attempt to clean up with a flimsy wiper. Similarly, these wipers are popular in HEALTHCARE, such as in aged care facilities, schools and childcare centers, where they are used by staff to keep surfaces clean and hygienic, from wiping down tables, chairs and floors to drying any liquid spills. When it comes to the HOSPITALITY industry, JUMBO RHINO ROLLS are a popular feature in hotels, restaurants, bars and sporting clubs, where these disposable restaurant cloths are torn off for ad hoc cleaning tasks such as cleaning up restaurant tables, chairs and eating areas, or used in the kitchen for the more challenging tasks of wiping grease and oil off stoves and other surfaces. Businesses in the AUTOMOTIVE industry, including re-sellers and fleet owners, use the heavy duty RHINO WIPES when detailing cars, vans, trucks, buses and other vehicles (and boats). Their thickness, absorbency and long lasting durability makes them well suited to drying off surfaces, cleaning off oil and grime, as well as wiping off machinery and mechanics' hands and tools. A very useful CAR CARE cleaning cloth that can be used for cleaning up equipment, machines and tools as well as soaking up oil spills in the garage or workshop. For PRINTERS and PAINTERS, the low linting feature of the JUMBO RHINO ROLLS is particularly useful. They can be used to prepare surfaces, and wipe off ink or paint or solvents with these thick absorbent, disposable wipers, and they enjoy the convenience of being able to carry the jumbo roll to and from site. So, if you are looking for a reliable, all purpose industrial strength wiper for heavy duty tasks, try the JUMBO RHINO ROLLS , and enjoy the benefits that this low linting, super absorbent, strong durable cloth has to offer. A portable, convenient and cost effective bulk wiping solution.